Villa de los Suenos - As the privacy gate rolls back, the beautiful tropical landscape dazzles you and the blue, blue ocean with views for miles mesmerizes even the most ardent beach lover. Custom built in 2011, the main level has 2 master en suites, a gourmet kitchen and the living area covered with floor to ceiling glass doors that open to a fun, covered patio complete with surround sound music, an outdoor kitchen and room for 2 tables that each sit 6. 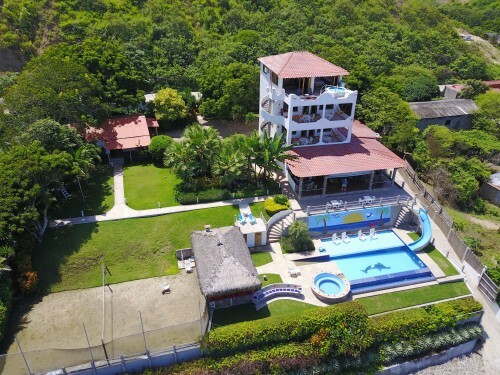 The upper levels house 4 more bedrooms all with tile bathrooms, ocean views and private balconies. The creme de la creme penthouse on top has a full kitchen, en suite tiled bathroom, private balcony with its own hot tub and lounge chairs. You will also find a beautiful infinity pool, and separate hot tub to relax in if you have been beach combing, or hammocks to stretch out in and read or just listen to the waves gently roll onto the beach. As the day comes to a close, and dusk takes over, the seagulls skim over the gentle waves in a synchronized ballet and the ball of sun changes from shades of pink to orange as it dips into the ocean shedding its glow on the fishing boats lined up on the shoreline as their lights blink on one by one. Time to slip on your dancing shoes and head out to one of the many delightful restaurants facing the oceanfront to dine, dance, listen to music or just relax. On this part of the Ecuadorian coastline about 10 min. from Mantanita, you find bustling nightlife along with local vendors that peddle their wares by day. There is fishing, surfing, beach exploring,hiking, delightful restaurants,and local, friendly people. No hurricanes, tropical storms, or tidal waves in this part of the Pacific, just sun, warm weather, and gentle ocean breezes every. single. day. This luxurious property is currently a well known destination resort but can be used as a family home if preferred. A separate casita with beach front access is located on the grounds and can be a separate purchase if desired. All indoor and outdoor furniture included in this amazing price. City Close-Country Fresh! Enter through the gated - City Close-Country Fresh! 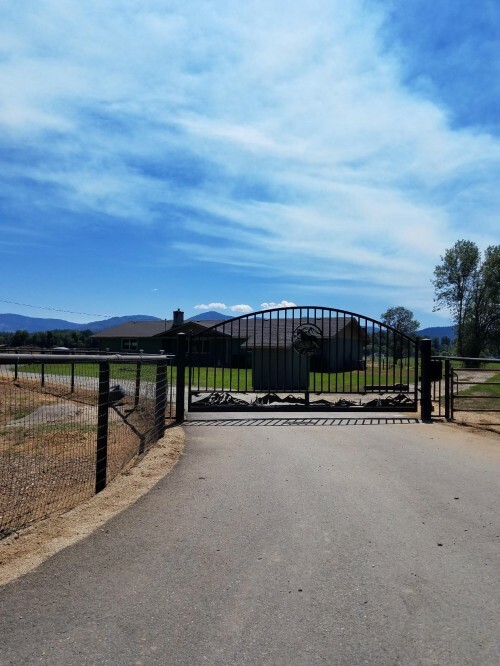 Enter through the gated entry to this dramatically updated 3 bed 3 bath home on 11.57 level, irrigated (Rogue River Irrigation rights)pasture land. Solid home offers unassuming charm that complements the environment, offers a sun-drenched kitchen that opens to spacious dining area--enjoy the wood burning stove in the lovely living room--large enough to hold a cub scout pack, oversized attached 2 car garage with workshop area and private room perfect for Costco trips!Fall in love with Texas-sized bedrooms & custom designed bathrooms!Everyone needs a private mud room with easy access to bathroom & sep. laundry before entering the house!Decorator colors throughout!Bring your animals to this fenced, cross fenced delightful property! Massive insulated barns (50x40 with drive thru insulated doors, 50x60 + additional building with 3 finished rooms: office, storage, craft room + laundry facility), equip. sheds,8 pastures w/ animal shelters. Brand New home! 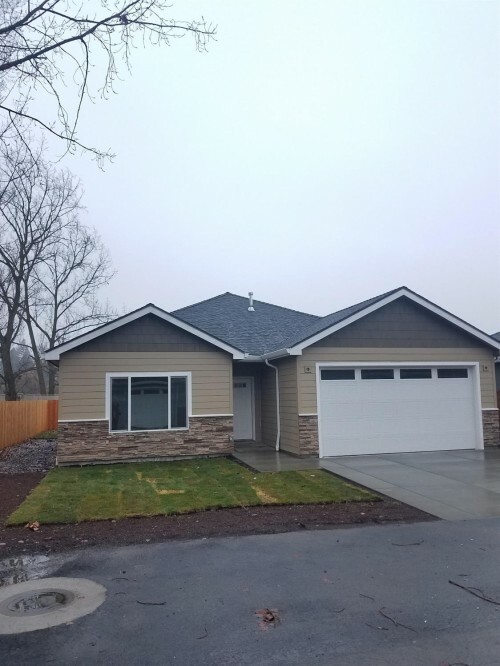 - This home is completed and ready to go! Brand new 3 bed 2 bath custom home. Open Kitchen design features shaker style cabinetry, full slab granite counters, stainless steel appliances & breakfast bar. Designer neutral colors complimented with vaulted ceilings, energy efficient lighting throughout. You will love the master bedroom! walk-in closet, great master bathroom -complete with granite counters and decorator colors! All bedrooms have good sized closet space not to mention storage throughout the home--entryway closet & separate hallway linen closet! Spacious living room opens to dining area with slider allows for easy access to 20 ft fenced backyard! 2 car garage is designed for storage. 9ft side yard--room to park toys! Easy to maintain landscape sited on a quiet lane! No through street completes this dynamite set up! 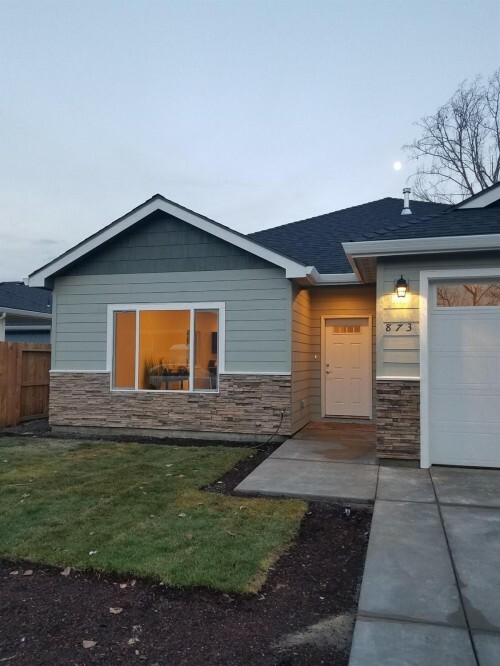 Close to Stewart Medical Plaza, Fitchner-Mainwaring Park & Stewart Golf Course, not to mention schools (Griffin Creek El& S.Med HS), shopping & more!